When it comes to Michigan’s new third grade reading law, which set down instructional and reporting mandates for K-3 schools and classrooms to launch beginning last fall, lawmakers and educators have some areas of consensus. Webberville Elementary School teacher Aaron Mayes reads with a student. Parent involvement in their children’s education is good. A team approach among educators is helpful. Training teachers in best practices is beneficial. And most importantly: Teaching children to read by the end of third grade is important. After that, the conversation becomes a little more complex. 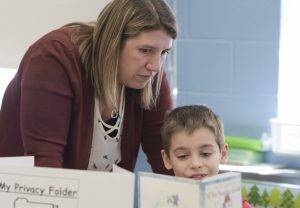 Elementary school teachers, literacy coaches, and interventionists from around the state say they always are striving to improve and learn new strategies for helping struggling or reluctant readers as required by the reading measure signed into law by Gov. Rick Snyder in October 2016. But many worry about the law’s unfunded mandates, inadequate support for districts and teachers, and over-abundance of testing and paperwork. In some ways, the law simply codifies what educators do as a matter of course, they say. They’ve always assessed children’s reading abilities and delivered instruction and interventions to meet them wherever they’re at and move them forward. But now every K-3 child must be assessed three times a year using a state-approved benchmark test. Below-grade-level readers must be given an Individual Reading Improvement Plan (IRIP) with a “read at home” component—all of which parents must review and sign. Teachers say they work hard to help each child learn and grow to his potential, but the law’s ultimate goal is to ensure every third grader achieves a “proficient” score on the M-STEP standardized assessment beginning in 2019 and beyond. Beginning in 2019-20, third graders who score one year or more behind grade level in M-STEP reading could be targeted for retention. That means this year’s first graders have their work cut out: Last spring, fewer than half of Michigan third graders hit the “proficient” mark. The controversial idea of automatic third-grade retention for below-grade readers was softened to allow for exemptions, but students who advance to fourth grade through one of the loopholes will have to spend a greater portion of their day in literacy activities—calling into question what changes will happen to fourth-grade classrooms in two years. Teachers across the state report seeing anywhere from one-third to two-thirds of their K-3 students needing IRIPs based on results from benchmark tests such as the NWEA. Districts determine their own definition of reading “deficiency” that requires an IRIP. Some districts have set the bar at the 60th percentile on NWEA, some at the 50th. Others use a different test the state has approved. Once the screening test flags readers labeled as deficient, a diagnostic assessment is used to determine in what areas they need additional help. The gold standard for testing a student’s reading ability is a Developmental Reading Assessment (DRA)—also known as a running record—a valuable but time-consuming one-on-one method that educators have used for years. Adrian teachers and reading specialists are using DRAs for diagnosing students’ reading issues, but that has meant by the time testing is done, IRIPs are written, and parents are notified, it’s not long before the next testing round begins and new IRIPs must be issued to parents. Educators are universally concerned about the amount of testing and paperwork required by the law. Even K-3 students receiving special education services—who already have an Individualized Education Plan (IEP)—must get an IRIP signed by a parent three times per year. “It’s constant assessing; it’s constant keeping track of interventions and the frequency of interventions,” said Allyson McBride-Culver, a reading specialist in Traverse City Schools. The record-keeping demands of the law take away from time to learn, plan, and collaborate, which constitute the real engine of change and growth for educators, many say. That worries Adrian’s Jeff Condon, who points out there are only so many hours in the day. As standardized test scores have taken on outsized importance in Michigan—affecting school ratings and teacher evaluations—most districts already beefed up literacy instruction with Tier 1, 2, and 3 instruction that includes intensive daily small group and one-on-one interventions. “I just don’t see a big difference between what we’re already doing and what the state is expecting will make a change,” said Holly Rives, a 20-year elementary teaching veteran in Forest Area Community Schools. Many teachers fear that labeling kids as young as five years old “deficient,” then focusing instruction exclusively on “components” of reading, risks draining joy from classrooms. They say they’re fighting to retain student choice and time for pleasure reading as part of the day. The law requires districts to use “evidence-based” instruction in five areas: phonemic awareness, phonics, fluency, vocabulary, and comprehension. Some say the move has accelerated district shifts toward “scripted” curricula which allow for less teacher-driven instruction based on educators’ expertise and awareness of students’ needs. What can help is job-embedded training from well-qualified reading coaches—such as Wiersma—who observe, model, and guide classroom teachers in their practice, experts say. Instructional coaching provides depth to professional learning, but it’s time-intensive and requires a different skill set than classroom teaching, said Tracy Horodyski, a former Michigan Teacher of the Year who is an instructional coach in Kenowa Hills near Grand Rapids. The law requires districts to provide literacy coaches, but lack of funding from the state has made it difficult to meet the mandate. The new law included $25 million in funding—or about $57 per K-3 child in the state. And while educators applaud any effort to get parents more involved in supporting literacy at home, they lament the law’s focus on compliance and “accountability” rather than support for a public education system that is asked to address all of society’s ills. Students come to school having suffered trauma. Some live in poverty or without a stable home. Others struggle with learning disabilities, emotional disturbance, or behavioral disorders. Some teachers experience a seven-grade spectrum of reading levels in one classroom. The expert voices of educators were not included in the drafting of the state’s new Third Grade Reading law, but MEA Lobbyist David Michelson wants to use their real-world expertise to improve it. Now that the law is being implemented, Michelson is organizing several MEA focus groups to gather the insights of members who know from front-line experience what is working and what is not. Michelson’s goal is to deliver specific recommendations for changes to lawmakers this spring. Focus group meetings will be held in various parts of the state in the next few weeks. Sign up to receive our email newsletter, Capitol Comments, at www.mea.org/signup to stay up-to-date on this and other MEA legislative initiatives.